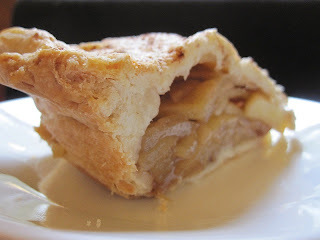 About a year ago I wrote a post for Apple Crumble Pie that started: "I hate pie. And I hate pie because pie hates me." My friends, I'm happy to say that those days are over. I love pie. And I love pie because pie llllllooooovvvvesss me :). Since the Peach Crumble Pie was a success I knew that the five pie crust doughs sitting in the freezer would produce similar (if not better) results. So right out of the gate I wanted to be a little more ambitious. It was time for apple pie. Not just a crumble pie, but a full on double crust. Such a thing had never been attempted in my kitchen. A year ago I would have never even imagined it possible. 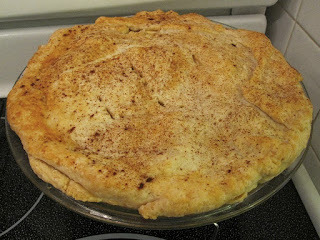 I used the same recipe as the one for the crumble pie (minus the crumble) and sprinkled cinnamon sugar on the top crust. 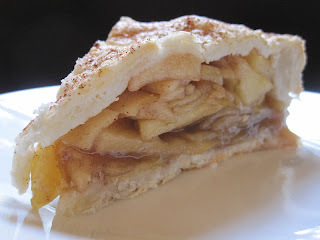 As it baked the intoxicating aroma of apples, cinnamon and nutmeg filled the house. I was nervous watching it bubble, terrified that all that moisture would ruin the crust. But when i took it out of the oven it looked fantastic and smelled even better. Yeah, it's pretty obvious that my dough rolling needs some work, but for my first attempt at a double crust, it was near perfect. And it tasted like it. My brother didn't even have a snarky comment for me. Just a point of preference for apples cut into wedges rather than slices. Things would never be the same. It was a fantastic pie. There is nothing like a fresh, warm, classic apple pie. It gives you that wrapped in a warm blanket fuzzy feeling. Your worries and concerns just melt away. Pure comfort. Something I needed a week before moving. After moving I was a little worried about getting back into my normal baking routine. 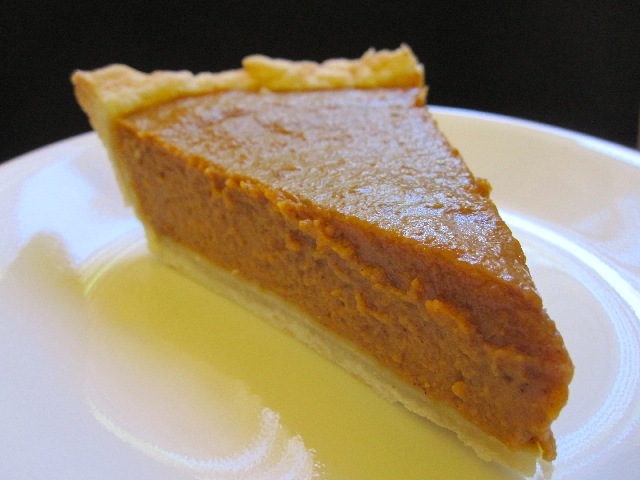 But just a week later I was in my brand new kitchen ready to work away on a pumpkin pie. 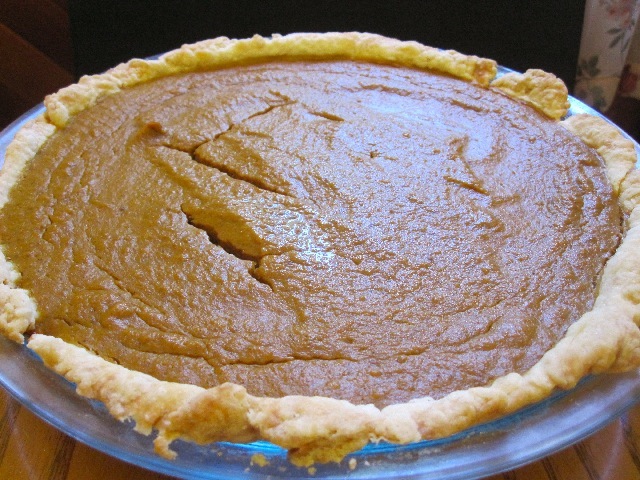 There had been plenty of whispered requests for one and I was more than happy to oblige (I love pumpkin pie). My pumpkin pie filling is pretty terrific (if I do say so myself, and I do :)), but this would be the first time I would be able to do it up proper using a pastry crust. And wouldn't you know it, another success! After a night in the fridge the pie was perfectly chilled and ready to be transported to my parents place for a mid afternoon snack. It was the single best pumpkin pie I have ever had. My apologies for the lack of new recipes, I'm still struggling to get back on track with my posting, but I assure you that I will. Here's a warning, the next two posts will also be for pies. Pies that I had never even tasted before making them. Both were excellent. They should be up a little later this week (hopefully before Thanksgiving). I remember I was worried when I made my first batch of pie crusts over a month ago that I wouldn't be able to use them all. Now I'm worried that there are not enough pie recipes for me to try :) (pssst...rhubarb need not apply :)). Those look great! I also have the same 'pie fear' you used to have, given that it is such a 'baker's test,' although I know avowed non-bakers who make pie and nothing else. You poor Canadians really have to get a 'jump' on the holiday season before us--we at least have another month to procrastinate and bookmark recipes. BTW--I know it's a harvest holiday like our own, but are there any special foods unique to Canadian Thanksgiving we don't usually serve in the US? I think we do it because we need so much time to prepare for Winter (and Christmas), what with all the snow and making sure the dogs are rigged to the sleds :). And you know, I racked my brain trying to think of something unique to Canadian Thanksgiving, but couldn't. But that might be just in my area (Southern Ontario). On the East coast it's probably a bit different.